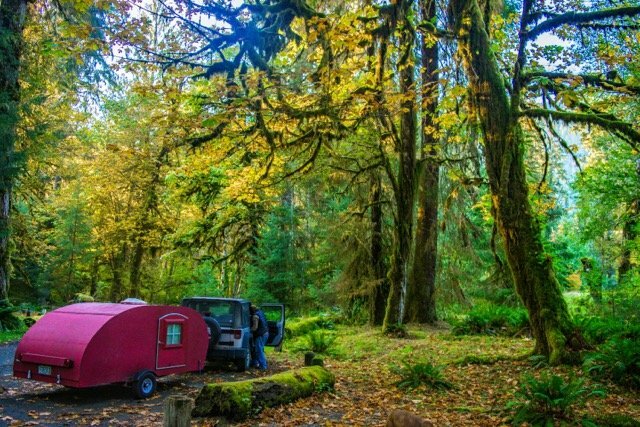 When Jason and Jesse Strong first brought home their tiny red teardrop trailer, the couple had no idea the future adventures they would share with it. 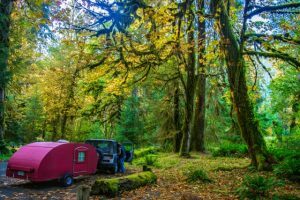 In fact, the trailer sat largely forgotten in their driveway for over a year until they decided to take it on a year-long trip, covering over 30,000 miles (and 3 new sets of tires), 23 states, and 29 national parks. Prior to leaving, the couple had only taken their camper out once. 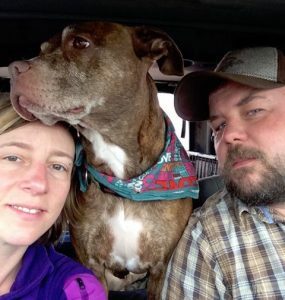 Behind their Jeep Wrangler, the attention-demanding “bed-on-wheels” with no power or plumbing became the fourth family member to the Strongs and their dog Freya, as well as the center of their creative growth. Jason and Jesse gave six months notice to their jobs before, and started saving up for the upcoming adventure leaving (Jason says they really should have saved more). They sold nearly all their possessions and researched free and cheap resources. Even still, Jesse calculated that they spent more money in the first three months of their trip than the following 9 months after they learned how to stretch their resources and generate new income. At one point, they camped for 2 weeks on less than $100. They did some workcamping on organic farms in California and Oregon. Jesse returned to her former job for a few shifts to cover holidays and busy times, and, after perusing through random crowdfunding sites for inspiration, the couple started selling their original artwork to help finance their trip. Both Jason and Jesse have creative sides that they dabbled with over the years – Jason’s sketching and Jesse’s photography have been side interests they have done for their own enjoyment. Out of curiosity, Jason started a Kickstarter to sell some of his fantasy and folklore sketches online, and found it was a hit. As their travels continued, Jason set up at local flea markets to sell his artwork. People at the markets would stop by his table to talk about his art, and he found a new confidence in his work. Art galleries in Kentucky and Ohio even showcase some of his canvas prints available for sale now. Jesse splurged on a Nikon DLSR camera and set up her own fundraiser where she would mail postcards with her gorgeous photos of places they had been to people every month. 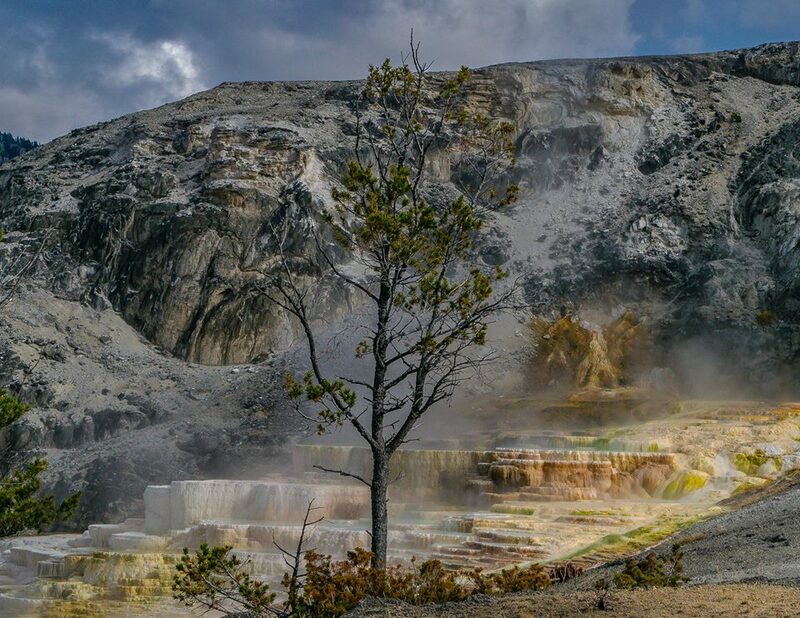 Some of the grand landscapes they visited provided a real challenge to capture in a camera lens. Jesse tries to capture the places she visits in a way that would inspire a feeling of “I want to be there” from the viewer. Jason says that their travels and their time in the tiny teardrop has helped them both focus on their creative side, and understand that there is a value to their art. Through the journey, they learned to give themselves permission to explore their creative eye, set schedules for their art, and they both grew in their artistic abilities. At the end of their year, both Jason and Jesse feel a profound change from the experience. They have learned to live more with less, have found support and encouragement from friends and family, learned to use the resources that are available, and did a lot of figuring things out and learning as they went. They used a GoalZero solar setup to charge phones, computers, and cameras, and have high praises for the LuminAid Pack Lite. The couple also used a pop-up canopy with removable sides to expand their living space, especially in wet or windy weather. Jesse says if you have a small indoor living space (teardrop, van, tent, etc. ), set up a large outdoor living space to make it feel more comfortable. She also loved her REI down camp booties that she wore nearly every evening. They also recommend eating out occasionally, but only at highly reviewed cheap places. They use the CheapEats filter on the TripAdvisor app to find some of the best meals they have had for under $10. They also share that trying dispersed camping even if you prefer a campground with hookups as it saves money and refreshes your sense of adventure. As for future plans, the Strongs are thinking ahead to an Art Festival Tour, but may save up for a slightly large camper (with an indoor work space for their art) first. 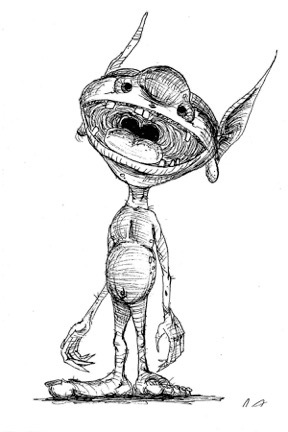 You can find out more about their adventure and art on their blog and Jason’s website. The only way to really know is to do it. Glad you liked our story! Absolutely love your story. It was very exciting and thought provoking. I have been planning for years to go cross country with my husband in a camper. Your story gives me hope we to can do it.